Wall sconces can get super pricey, especially considering you usually need to buy two of them! We’re here to help. Today we are making this super simple and sleek industrial style wall sconce! Start by grabbing your light cord and removing the part of the cord that holds the lampshade in place. This should screw off easily. Next, go ahead and wrap your wire around the threading where the piece you just removed once was. Wrap it around once so that the two ends of the wire are facing the same direction. Once wrapped, go ahead and screw the piece back on to sandwich the wire along the threading. Next, go ahead and screw in your lightbulb. We are doing this just to get an idea of how we’d like the end sconce to look! Next, grab a 1x2” piece of pine and use this to estimate where you would like your wire to go into the piece of wood. This will determine how far away the sconce sits from the wall. Mark this spot along the wire, and cut about an inch and a half down from where you marked! Next, bend the wire in at the marked point. Next, we grabbed out 1x2 piece of pine again, and marked how long we’d like this piece to be. This length is up to you and your style preference, but we decided to make this piece quite short (about 3 inches in length). Our general goal is to make sure that the wire will sit straight towards the wall. Go ahead and cut this with a hacksaw and sand to smooth. Let’s get drilling! We went ahead and drilled two holes on the shorter sides of the wood for the wire to sit inside of. These holes should only be as deep as the length of your bent pieces of wire. We also went ahead and drilled two holes in the middle of the piece of wood vertically to act as pilot holes for our screws to hang the sconce later. To insert the wire into the holes we created, go ahead a strip the ends of the plastic outer layer, put construction adhesive inside of the holes, and insert the wire. Let this all dry overnight to allow it to fully cure. Finish off the job by priming and painting the entire thing! We decided to go with a sleek black. 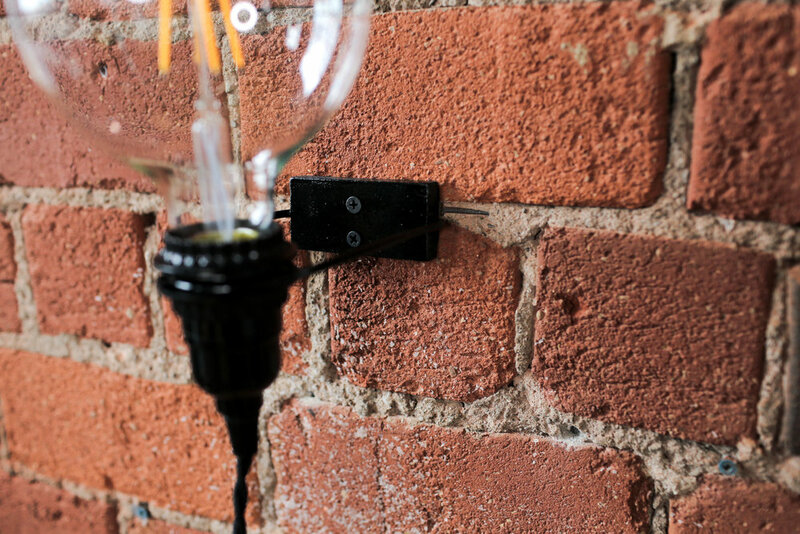 Simply attach to the wall through the two pilot holes, and add your cord and light bulb! Be sure to check out the video below for more wall sconces! AND if you decide to make any of them, tag us on Instagram using the hashtag #SorryGirlsSquad!